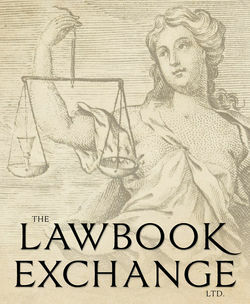 Looking for law books? Biblio.co.nz hosts hundreds of of the finest online book stores and booksellers, including specialists in law. Use the list below to locate a specific specialist bookseller or book store near you. Or, use the form below to search the inventory of all booksellers who specialize in law. We have many years of experience and knowledge in selling on the web and we carry hundreds of books at reasonable prices. We offer lightning quick shipping. Most of our orders are shipped the same day they are received and have tracking numbers uploaded to Biblio with 48 hours. Every item listed in our online store is housed in a single location which makes it possible for us to pack and ship all orders within 24 hours. General stock of approximately 8,000 titles with a concentration in non-fiction. The more unsual the better if we can find it. We are always buying libraries and collections in the Greater NYC and CT area including Greenwich, Westport, Darien, New Canaan, Weston, Wilton. The bookshop was founded by Miguel Miranda Vicente in 1949. At that time, it was located on the Prado Street, next to the Athenian of Madrid. Don Miguel relished alternating between the life of a bohemian bookseller, athenian, and intellectual and his life as an actor in the Spanish Theater of Madrid. Little by little, he became more captivated by the world of books until he left the theater to devote himself entirely to his bookshop. Over time, the shop became a social gathering place for academics, intellectuals, university professors, and many others of diverse cultures and interests. The social and intellectual life of the shop was almost as important to Miguel as the books he was selling. He would later transfer to a location on Lope de Vega Street, where actually the shop is ruled by the grandson, Miguel Miranda Barrientos, just in front of the tomb of Cervantes! I am a book collector and seller with many years experience. My particular areas of interest are politics, history, law, economics, labor and sociology. I also collect and sell Vermont and New England books, pamphlets, ephemera and magazines. I have general stock of literature, sciences, arts, world and regional politics & history. Specializing in antiquarian Anglo-American law and legal history. "Nostre livers": "our books (usu. meaning year books)."--J.H. Baker, Manual of Law French, p. 141, s.v. "livers" (1990). Early modern manuscripts and printed books in all fields, especially law, medicine, gastronomy, emblem books, and the Reformation. We also specialize in antiquarian bibliography and books-on-books.